I'm not a "Harley guy" -- nothing against them, they're just not for me. However, a Press Release I received today from H-D may be of interest to some of you. It seems the XR-750-inspired XR1200, released in Europe in April, is coming to the US, beginning with a pre-sale of 750 units that starts on December 1st. 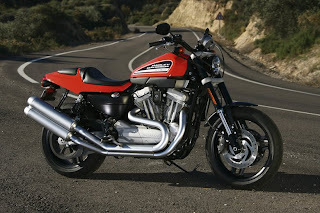 My research tells me the US delay was necessary because another company owned the US trademark for "XR1200". In the photo that accompanied the release, one can see the flattrack-inspired bodywork, minimalist front fender, sparse instrumentation and USD forks. Nice to see the chrome has been kept to a minimum; note the black handlebars and satin-finish exhaust. The pillion pad and belt drive don't exactly scream racer, though. Might make for a fun commuter or short-distance backroads blaster. Thanks for the heads-up! You're post some news even before the cycle magazines. I'll keep reading daily.